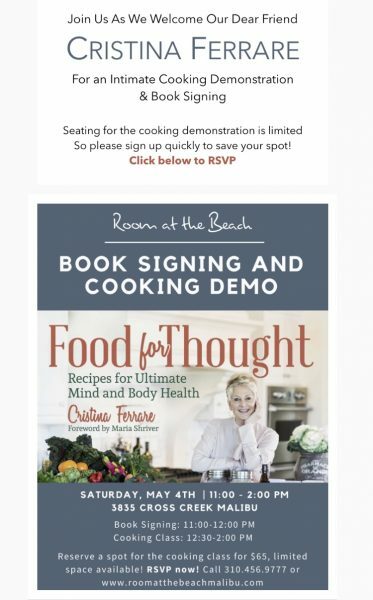 I’m excited to announce that I will be signing books and doing a cooking demonstration from my cook book, “Food for Thought” at “Room at the Beach”, in Malibu, Saturday, May 4th. 11:00 a.m. to 2:00 p.m. I will be making a dish for Mothers Day since it is right around the corner! ! 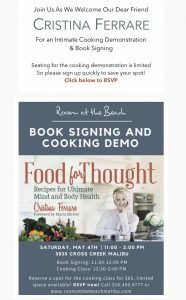 Part of the proceeds from, “Food for Thought”, are going to the “Woman’s Alzheimers Movement” Please come and celebrate mothers, and friendship! I hope to see you there!